We stood on an edge of a large canyon-like drop and looked at thousands of trees’ canopies materialising from the giant white clouds. We were higher than them! Soon enough though, we realised that in fact we weren't looking at the clouds - it was the misty fog moving quickly from West to East. The rainforest was simply breathing. The ecosystem here felt different, the weather was quickly changing, it was humid and cloudy and the next minute the sun would come out. We got back to the car and continued to drive through the smooth windy road dividing the forest in two. From time to time we would slow down to have a look at Rwanda's mountain monkeys sitting by the road - they were just as inquisitive of us as we were of them! We’re not sure if it qualifies in the category of ‘the most scenic routes’ since all you look at on both of your sides are trees, but they’re so magnificent! We felt like we were in a movie - not sure what’s waiting behind each sharp tour, the trees up to 70 metres high looking down us and the mysterious fog following us or making us slow down because we couldn’t see anything beyond our car’s bonnet. 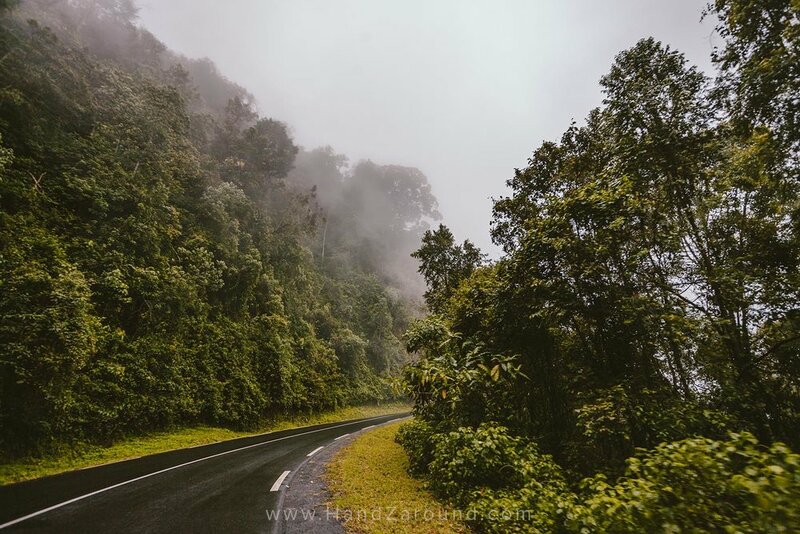 These were our first impressions of Nyungwe Forest, but we think we’re pretty accurate to call it simply an Enchanted Forest! which has general information about visiting Rwanda. The Nyungwe Forest is found in South West of Rwanda in Rusizi District. It stretches over 1020 square kilometres. Its biodiversity is overwhelming! It’s home to 10 of the 13 different primates and rich in endemic species (it has over 240 different tree species and over 1000 different plant species!). If you love birds, you’re kind of lucky because Nyungwe has almost 300 species to try and spot… pretty amazing, isn’t it?! Like many places we visited in Rwanda, this is yet another one that’s not very popular to anyone who may be a first-timer to the country. And so it was to us. We were confused about what Nyungwe Forest really is: is it a protected park? A reserve? Is it a safari destination? Can you visit on your own or with a guide? Why would we even go there? We managed to find answers to all those questions through trial & error and we definitely don't regret visiting Nyungwe Forest. 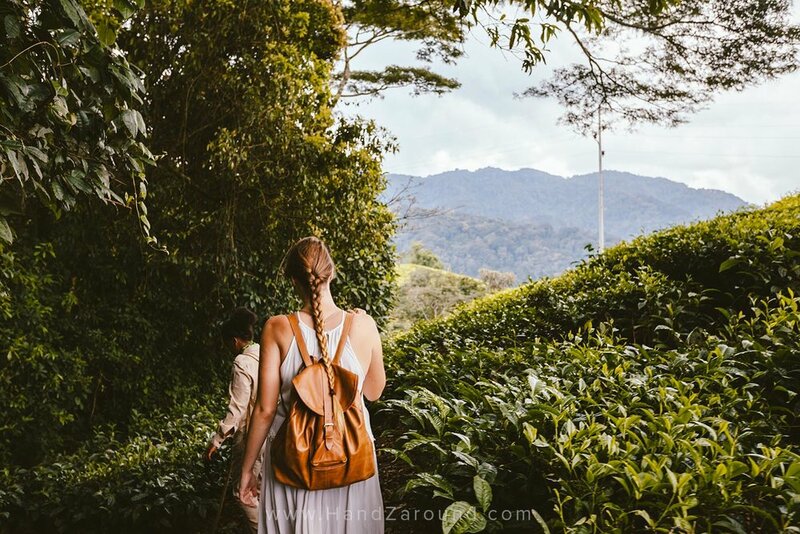 We thought we would share with you what we learnt and hopefully we’ll make this enchanted forest known to more people who love off-the-beaten track places, because you can certainly call Nyungwe Forest that. can you visit nyungwe forest on your own? 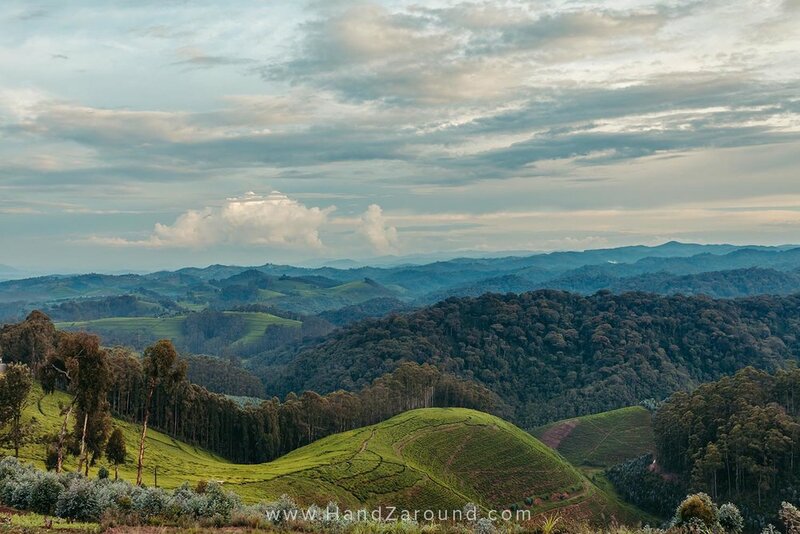 Nyungwe Forest is a fairly new National Park of Rwanda however it is not a safari destination. It doesn’t have restricted borders like some of the other national parks in Africa. Due to the presence of chimpanzees, and some of the mammals like leopards (as RDB states), as well as a complex structure of the forest (very old trees with strangling branches, swamps and difficult terrain), you’re not allowed to venture into the park on your own, you need to have a guide. What is great though about Nyungwe is the ability to drive through the whole park in your car and you don’t need any entrance ticket to do that. The road is amazing but do keep in mind that it takes about 1.5h to cross the park as the turns are very sharp. The road through the park is pretty amazing! In the park you can find three offices - Kitabi (on the Eastern entrance of the park), Umwinka (in the centre of the park) and Gisakura (on the Western side of the park). All three centres can give you some information about activities that you can do in Nyungwe (although sometimes information in one centre may be contradicting to the one in another centre so keep that in mind…). At the Kitabi office, for some reason you cannot book any activities - you have to make your way to Umwinka or Gisakura or you can simply book everything online (which nobody told us about and we learnt about it only after the fact). All you need to do to book your Nyungwe Forest activity online is to visit Rwanda Government’s Irembo website. Irembo is an e-Government services website where citizens, and turns out foreigners as well, can sort out their lives in an easy way. Once you find yourself at Irembo website, you’ll see the prices for the gorilla treks, ignore that. Click ‘Buy Permit’ and on the next page you will be able to book not only gorilla treks, but also any other activities on offer in any of Rwanda's National Parks. An annoying thing is that if you’re travelling by public transport (there are plenty of buses to bring you from Kigali to Nyungwe), you won’t have a mode of transport to get to the information centres and this is where all the activities start. You can possibly book a car from one of the three centres but the cost is 150 USD per day (!!! ), unless you have your own car, then it costs you about 30 USD per day - we rented ours in Kigali. There are also buses going through the main road in the park several times a day but you need to ask around where exactly and what time they stop. When we went chimpanzee trekking, we had our own car and we got to the centre only to find out that there are two more groups of people, each of them arriving in their own car… so in the end we were travelling to the chimpanzee trekking in three cars: a minibus with a driver and one person; another car with a driver and one person and us with our two newly-met friends who we met at our accommodation. So ask around at your guest house/camping/hotel - maybe there will be someone going to the same activity and they may have a car. Renting a car in the park may be quite pricey but in Kigali it can be up to 5 times cheaper! 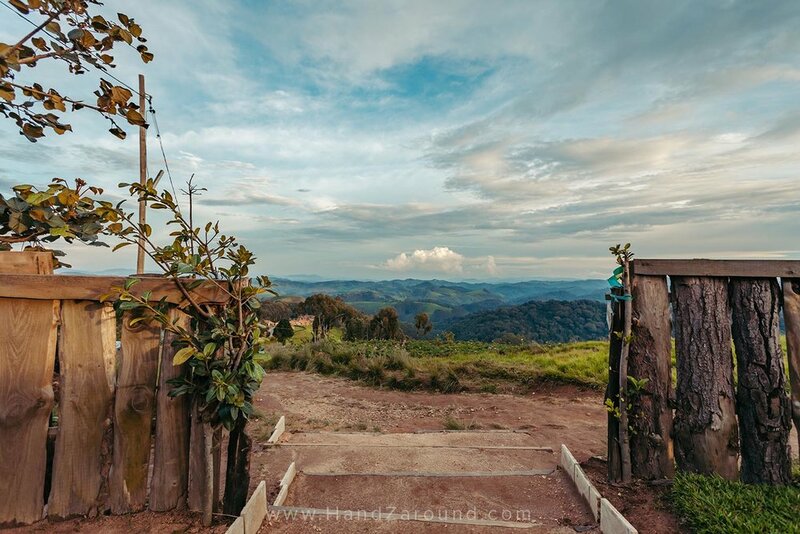 Nyungwe has plenty of trails that feature viewpoints, birdwatching spots, tea plantations views, waterfalls etc. 11 different trails from Uwinka Centre from 2km to 42km and from 1.5h to 3 days. 2 different 2km (3h) & 5.3km (4h) trails from Gisakura Centre. 4 different trails from 3km to 7km and from 2.5h to 6h from Kitabi Centre. 5 different groups of primates that you can visit: chimpanzees, angolan black & white colobus monkey and grey-cheeked mangabeys. Igishigishigi Trail from Uwinka Centre (leaving at 9am, 11am, 1pm or 3pm) - 2.4km, 1.5h, includes visiting the canopy walkway. Canopy Walkway itself from Uwinka Centre (leaving at 8am, 10am, 1pm or 3pm) - 2km, 2h. Umuyove Trail from Uwinka Centre (leaving at 9am & 1pm) - 5.6km 9.5h, includes a waterfall visit, enormous trees and their canopies. Imbaraga Trail from Uwinka Centre (leaving at 9am) - 9.8km, 6h, includes a visit to 4 waterfalls. Isumo Trail from Gisakura Centre (leaving at 9am & 1pm) - 10.6km, 4h, through tea plantations, includes seeing big waterfalls. Ngabwe Trail from Kitabi Centre - 4.6km, 4h, has good views and a campsite at the top. Book min. 1 day before. Colobus Monkey Tracking from Gisakura (leaving at 8am, 10am, 1pm and 3pm). Book earlier. Colobus Monkey Tracking from Uwinka (leaving at 7am and 11am). Book earlier. Mangabey Monkey Tracking from Uwinka Centre (leaving at 9am). Book earlier. Chimpanzees Tracking from Uwinka Centre (leaving at 5am or 7am). Book earlier. All tours are guided by park guides. Primates trekking is not allowed children under 16-year-olds. Besides tours operated by RDB, you can also find great walks and activities in Kitabi EcoCenter. It’s literally opposite the Kitabi Information Centre on the Eastern Part of Nyungwe. Their tours are often guided by the ex-poachers who now understand the importance of preserving Nyungwe’s natural flora and fauna. We went for a Mushabarara trek with them and we really liked it - we learnt so much about the plants, animals and how the poachers used to live and work in the forest. To find out exact prices of activities (because you don't pay for the entrance to the park but you can only enter the forest when doing an activity) we spent a lot of time in one of the information centres as the whole pricing system is rather confusing to us. Eventually we learnt that you can check prices online (following the same link that you use for booking activities). We also comprised the prices of activities in the table below so that you can find out how much is each activity - the prices information in the table was given to us at the Gisakura Information Centre and are accurate as of 2018. 1. Primates trekking is not allowed for children under 16-year-olds. 2. A group of 10 or more people is eligible for 30% discount. 3. Children under 7 years of age do not pay. 4. Graduate students pay full price. 5. Commercial filming is 1000USD/group/day for chimpanzees & 600USD/group/day for other activities. 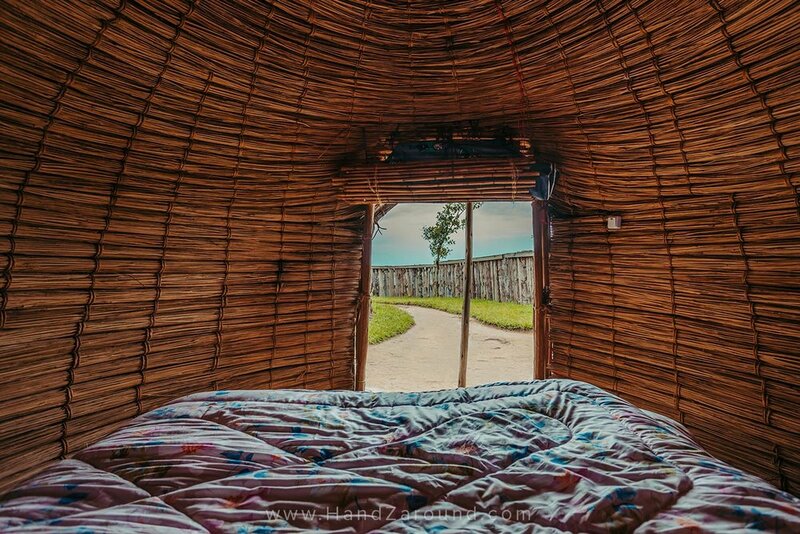 Tent rental costs 10,000 RWF per day. Transport from your accommodation to Visitor's Centres, where the activities start from, is not included. Car rental in the park costs 150 USD per day. We love staying in unique accommodation and Nyungwe is perfect for that. Staying in the forest and finding out where exactly to stay may be a bit of a challenge though as there are not many options. Here are our recommendations. Placed by the Western entrance, near Gisakura Tea Estate, this extremely exclusive lodge is part of the One And Only chain. You can expect all the facilities and magnificent views that you can think of when paying over 1,000 USD a night. We were very lucky to spend a night at the Nyungwe House and obviously loved its decor, food, activities and views. It’s definitely a place for people who need to have western luxuries and be spoiled and pampered. Unless you stay with them, you will not be allowed for coffee/dinner at the gate, plus, it’s kind of tricky to find anyways so you will not end up there by accident. That would be our mid-range option because you can get food there and use bathroom/shower although ‘rooms’ don’t have private bathrooms/showers. We stayed in Kitabi for two nights and really loved its vibe and the cosiness of our accommodation! It’s a beautiful place located on the Eastern entrance to Nyungwe. It has a camping site where you can pitch your tent or rent Kitabi’s tent, or you can stay in the King’s or Prince’s Palaces. These are traditionally made huts that Kings & other royals used to live in. They’re super cosy and comfy and make for a one-of-a-kind experience! Kitabi EcoCenter employs many local people and supports the local region. 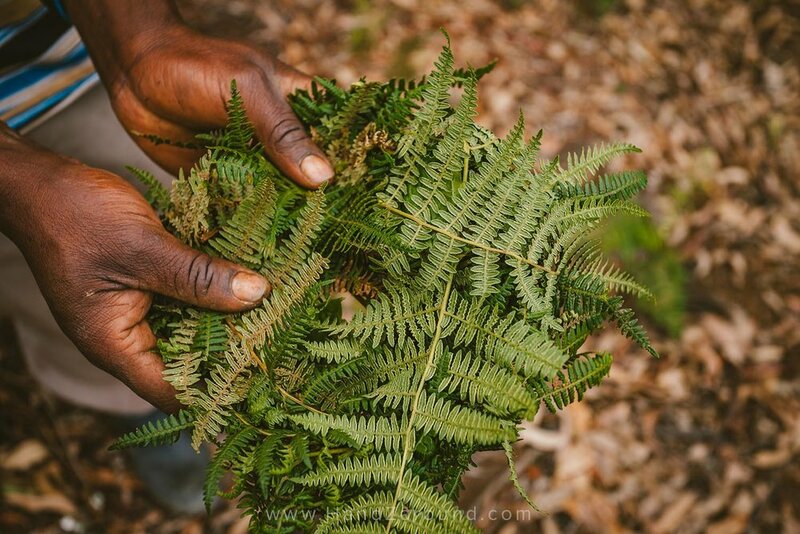 Former poachers now work at Kitabi towards conserving the forest. The Kitabi kitchen offers a daily prepared menu (basic Rwandan food) but they also have a great pizza oven so you may be lucky and visit Kitabi on a pizza baking day! They also have beers, soft drinks and water on offer. 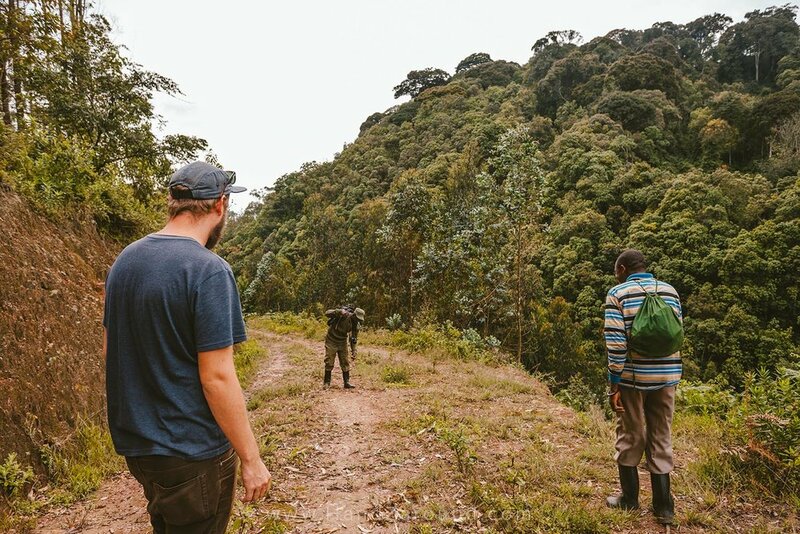 There are a few campsites scattered around Nyungwe, some of them are accessible just off the main road and some of them require trekking. You will get the best information at one of the RDB information centre. We haven’t stayed at any campsite in Nyungwe but we do know that there is a campsite near Umwinka Information Centre and one near the Canopy Walk. We saw some pictures which looked as if there is a wooden platform that you pitch your tent on and basic toilet facilities. There is a canteen near Umwinka Centre where you can get food. We were hosted by Nyungwe House and Kitabi Eco Center which we thank our supporters for, but as always, all opinions are ours.